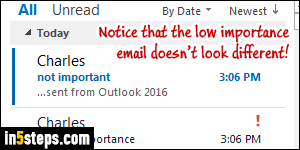 To attract your email recipients' attention to a particular message, you can set its importance / priority level to "high". How that message appears to them depends on the webmail provider, desktop email client, or mobile mail app they are using. But in nearly all cases, that email will look different, somehow. This screenshot shows a low-importance and a high-importance message in my inbox in Outlook 2016. In iPhone Mail, no indication was shown either way. When you compose a new email, the Message tab should automatically be selected. (Tip: you can make Outlook always show the ribbon.) 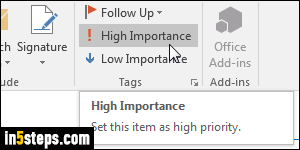 The priority levels are automatically shown on the right: click on High Importance to give that email a high priority; click once more to revert to "normal importance", the default. 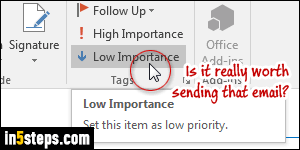 Click Low Importance to mark it as low priority; click again to change it back to "normal". High Importance is like "ASAP": to be used judiciously! 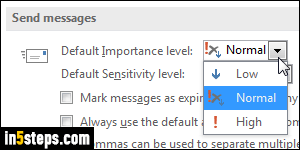 Bonus Tip: you can also change the default priority level for all messages you compose in Outlook. Unless you work for a collection agency or some critical government agency, you probably shouldn't automatically set an importance level, but the setting is there if you want it. In Outlook 2016 / 2013 / 2010, click on the File menu (top left), and select Options from the Backstage view. Select the Mail settings on the left, and scroll down until you see the Send Messages header. Under the Default Importance Level dropdown, which is appropriately set to Normal by default, pick either Low or High. Click OK. Bonus Tip: we generally use the high priority flag for emails we send. 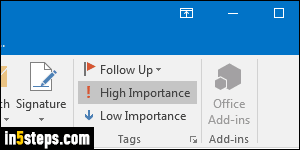 But Outlook lets you also change the importance of messages you received. To mark the message as important, double-click on it in the folder, and click on the File button (top left). Click on the Properties button on the right - the same steps that lets you view email headers. Set the Importance to High. Close the Properties dialog and close the message - click Yes to save your changes.